This article describes how to control access to metadata fields. Access to metadata fields is split into permission for viewing these fields and permission for editing these fields. Managing metadata permissions is done on the User page or the User Groups pages of the Management Console. Access the Elvis Pro client through the following URL, log in using system administrator credentials, and choose Management Console from the Avatar menu. Step 2. 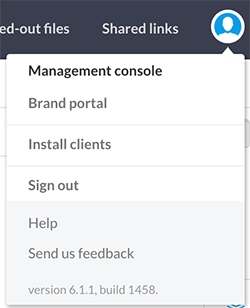 In the menu on the left of the page, choose Permissions followed by User Groups or Users. Figure: The Users page in the Management Console. View and Edit rights are assigned to users and user groups as part of assigning Permissions. Note: The settings made here apply to all assets that the user or user group has got access to. A typical workflow is therefore to set up various groups and assign specific settings to each group. A photographers group for example would need access to all Dimension fields whereas such fields are of no interest to a copy writer. Assigning rights can be done manually or as part of copying Permissions from an existing user or user group. Step 1. On the Users page or on the User Groups page, select a user or user group to which you want to assign View and Edit rights for metadata fields. Tip: Use the Filter to quickly find a user or user group. For more information, see "LDAP search failed" error when searching for users in Elvis 6. Step 2. Select Metadata from the menu. Step 3. Select the check box for each field for which View and Edit rights need to be given. Tip: Hover the mouse over a name to see a short description of that field. Now that Edit rights are set for specific fields (see above), the next step is to specify which assets can be edited this way. Such rules basically define access to a group of assets, such as those in a specific folder. By enabling the 'Edit metadata' option of that rule, you are basically saying: "for these assets allow the user to edit metadata fields, but only for the fields that have been selected in the Metadata fields tab". Example: A user is given permission to view and edit the Rating field. Next, a Rule is assigned to the user that provides access to the Demo Zone folder. Within the Rule, the permission to edit metadata fields is enabled. As a result the user can edit the Rating field, but only for the assets within the Demo Zone folder. 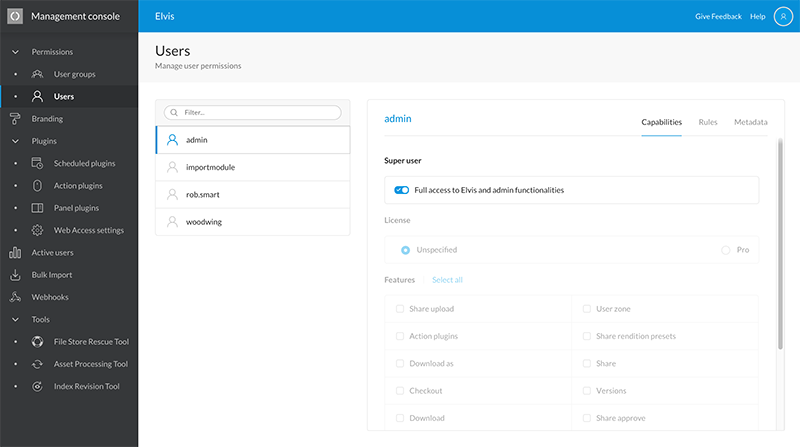 Assigning Rules is described in Controlling user access to folders and assets in Elvis 6. 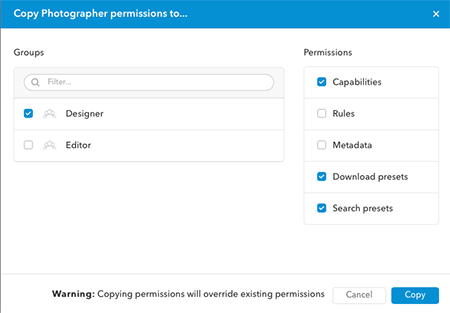 3 April 2018: Updated section 'Controlling which metadata fields a user can see and edit' by adding steps for copying Permissions.